Even Shabana Azmi and Juhi Chawla, playing the two principal roles, can do little to lend the film any sheen. The director's heart bleeds for ill-treated teachers. Nothing wrong with that. But is it good enough? For intention, Chalk N Duster might get full marks, but the execution is so hopelessly ham-fisted that the film can only be described as an absolute botch-up. Jayant Gilatar's approach to filmmaking and storytelling is clearly governed by the 'anything goes' principle. Not surprisingly, it yields pathetically slender pickings. It goes the whole nine yards to show us how abysmal our education system is, but Chalk N Duster does no justice to either cinema or to the cause of the noble profession that it attempts to celebrate. Shrill, slight and sanctimonious, the film is about a pair of teachers who, after being subjected to a great deal of harassment, turns the tables on an insensitive management. The men and women who mould the minds of the young have a low status in this country despite all the talk about India's glorious guru-shishya tradition. Chalk N Duster takes over two patience-trying hours to make that point with the aid of stilted dialogue and utterly vacuous scenes. The film presses into service all the cliches in the book, including a heart attack brought on by a harsh decision and a live make-or-break television quiz show. If the idea is to whip up some drama, it is totally misdirected. Silly and stupid are the only adjectives that come to mind as the mawkish Chalk N Duster unfolds, with the likes of Rishi Kapoor (as the quizmaster) and Jackie Shroff (as a school owner who believes education is a mission and not a business) being reduced to sorry butts of ridicule. The film's cast also has Girish Karnad in the role of the chess-loving, wheelchair-bound husband of an altruistic math teacher who devotes her free hours to educating financially disadvantaged children. It is unlikely that the veteran actor has ever been part of a less worthy film. 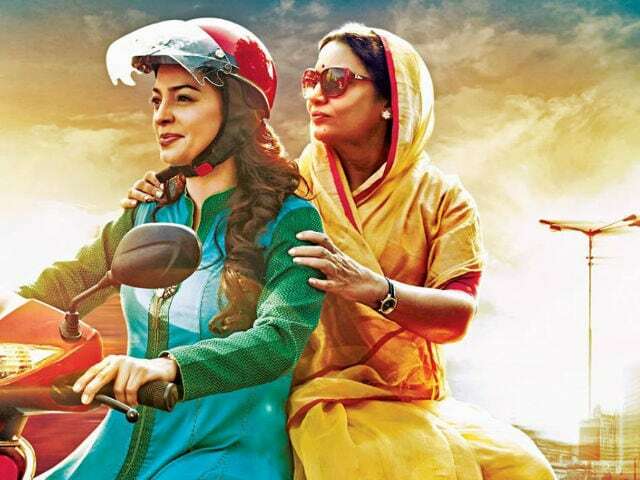 Shabana has a couple of meaty scenes to dig her teeth into, while Juhi, in one long TV interview sequence, is allowed to deliver a lecture on Dronacharya and Arjun and exhort youngsters to stand up for their teachers. While both actresses, seasoned as they are, do their best to achieve a semblance of believability, the clumsy writing and the unimaginative direction do them in completely. The only other actress who gets as much play as them is Divya Dutta, who, in the guise of the chief antagonist, goes all out with her untamable vixen act. But like the rest of the film, the characterization is far too single-track to be convincing. Chalk N Duster is set in a school headed by a harridan (Divya Dutta), who wants to weed out the old and embrace the new. With the tacit support of the school's director (Arya Babbar), this 'female Hitler' makes life miserable for the teaching staff who, she believes, have outlived their utility. "We need upmarket teachers," she announces and proceeds to humiliate those that have been on the payrolls for years. One teacher (Upasna Singh) is rudely ticked off for arriving four minutes late. The Hindi teacher is dropped from the roster and made the physical instructor. The sadistic principal dispenses with free tea for teachers, takes away chairs from the classrooms, and withdraws the fee waiver for children of the school staff. This last decision shatters a widowed teacher. When she reminds the principal how needy she is and how much her son needs the exemption, the latter quips: "Single status matrimonial ads mein achcha lagta hai, management decisions mein nahin." The hapless lady is forced to take her son out of the school and enroll him in a municipal institution. The flashpoint comes at the halfway mark. One veteran teacher suffers a heart attack when she is accused of incompetence and summarily dismissed from service. She ends up in hospital dangling between life and death. The owner of a rival school (Jackie Shroff) tips off a television journo (Richa Chadda) who wades into the fracas with glee. The news erupts on the idiot box and on social media. Sympathy mounts for the victimized teacher. And the school principal finds herself under pressure to defend her actions. But the headmistress quickly regains her composure and declares: "She was a question mark on the reputation of the school. I hate question marks. I like full stops." We all do. But Chalk N Duster is a sentence that meanders through miles of meaninglessness before it decides to draw the line. Eventually, the audience is left with a bunch of question marks. Granted that in this country teachers rarely get their due. But did they deserve this?